Hemp Food, Body Care, CBD and Supplements Retail Market in U.S.
WASHINGTON, DC – Vote Hemp, the nation's leading grassroots hemp advocacy organization working to change state and federal laws to allow commercial hemp farming, has released final estimates of the size of the 2016 U.S. retail market for hemp products. Data from market research supports an estimate of total retail sales of hemp food, supplements and body care products in the United States at $292 million. Sales of popular hemp items like non-dairy milk, shelled seed, soaps and lotions have continued to increase, complemented by successful hemp cultivation pilot programs in several states, and increasing grassroots pressure to allow hemp to be grown domestically on a commercial scale once again for U.S. processors and manufacturers. Vote Hemp and Hemp Business Journal have also reviewed sales of clothing, auto parts, building materials and various other products, and estimates the total retail value of hemp products sold in the U.S. in 2016 to be at least $688 million. 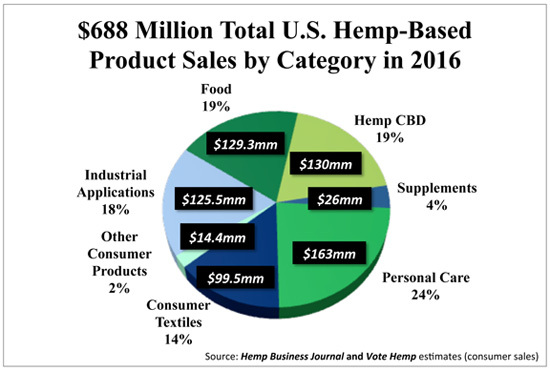 Of this $688 million hemp market, Vote Hemp and Hemp Business Journal estimate that hemp foods constituted 19% ($129.3 million); personal care products constituted 24% ($163 million); textiles constituted 14% ($99.5 million); supplements constituted 4% ($26 million); hemp derived cannabidiol or CBD products constituted 19% ($130 million); and hemp dietary supplements constituted 4% ($26 million); industrial applications such as car parts constituted 18% ($125.5 million); and other consumer products such as paper and construction materials accounted for the remaining 2% of the market. to nearly 25% in 2016. "Vote Hemp estimates the total retail value of all hemp products sold in the U.S. to be at least $688 million for 2016," said Eric Steenstra, President of Vote Hemp. "To date, 32 states have passed legislation that allows hemp farming per provisions set forth in the 2014 Farm Bill, and the U.S. remains the largest consumer market for hemp products worldwide. However misguided drug policy still prevents our farmers from cultivating hemp at the scale needed to meet consumer demand, so instead nearly all the hemp to supply the U.S. market is imported. We need Congress to pass federal legislation to allow commercial hemp farming nationally, to let our farmers and American business take advantage of the robust economic opportunity hemp provides," continued Steenstra. Data was gathered and analyzed in partnership with Hemp Business Journal, the leading provider of market intelligence to the hemp industry. Sean Murphy, founder and publisher of Hemp Business Journal said, "The hemp industry is being lead by the Natural Products channel. Food and personal care categories have traditionally lead the industry and continued to do so in 2016. The emergence of Hemp CBD—a category growing at 53%—drove the hemp industry to a total market size of $688 million. Hemp Business Journal estimates $130 million in hemp industry sales is from the Hemp CBD category, nearly 20% of the total market. This category is being driven by channel sales in the Natural Products Industry, smoke shops and online verticals, with pharmaceutical players quickly moving into position to capture market share." To date, thirty-two states have defined industrial hemp as distinct and removed barriers to its production. These states are able to take immediate advantage of the industrial hemp research and pilot program provision, Section 7606 of the Farm Bill: California, Colorado, Connecticut, Delaware, Florida, Hawaii, Illinois, Indiana, Kentucky, Maine, Maryland, Michigan, Minnesota, Missouri, Montana, Nebraska, Nevada, New Hampshire, New York, North Carolina, North Dakota, Oregon, Pennsylvania, Rhode Island, South Carolina, Tennessee, Utah, Vermont, Virginia, Washington, West Virginia and Wyoming. Vote Hemp is a national, single-issue, non-profit organization dedicated to the acceptance of and a free market for low-THC industrial hemp and to changes in current law to allow U.S. farmers to once again grow the agricultural crop. More information about hemp legislation and the crop's many uses may be found at www.VoteHemp.com orwww.TheHIA.org. Video footage of hemp farming in other countries is available upon request by contacting Lauren Stansbury at 402-540-1208 or lauren@votehemp.com.